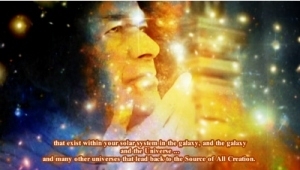 Valerie: We are calling on Cosmic Sai Baba to make His presence amongst us. It is Tuesday, 5th of January, 2016. And we welcome his presence. We have prayed for Peace to exist and we are asking for a Miracle, for there are so many people around the world who are praying for peace. We are calling upon Cosmic Sai Baba to create a miracle so there is no doubt (in the minds of people) that the Source of Creation – and God – do exist. And we only need one focus – and that is Love. Universal Love. Kindness. Compassion. ❝I am here! And I am very pleased to be here – this day. There has been a time on this Earth – of festivities – of a season you call Christmas. And Christmas is a time that has been celebrated long before Jesus. For some of whom were upon Earth. It came from the very beginning of teachings that were upon this Earth, to help the humans to know and understand who they really are. There comes an inner Sun. The inner Sun – glows. It is Light. And people refer to Divine Light that comes from the Sun; and the warmth of it – and how it makes you feel. You feel lifted; you feel happy – when there is gentle warmth. And this is the Love that we speak of from other worlds. When we speak, and sometimes have influenced different beings of those who are called Prophets that write of these things. And they talk about the Spirit, which is Light. It is within you as a human – and it is around you. It was seen – and is seen – by psychic people. But it is also seen with ‘machinery’ that operates in your medical world – in what you call hospitals – and they see what used to be called an aura – but it is the same; it is Light. And they see colours. And colours – of course – make up Light. They make up White Light. I am bringing this to your attention because I want you to really think about who you are. And I can say to you that you are Light Beings. You have a Soul. Well in some ways you would call a Soul the Sol (or the Sun). And it is the inner Sun – of you! It is only when you allow emotions to take over you that it becomes an energy that is the Shadow. And blocks the light … … … to some degree. So my message today – is to ask you to free yourself of the emotions that are negative – in that they are like a shadow that hold back the brightness of your natural light which can be related to things like positivity – or a creative thought – and emotion. You can think about this. This (light) is what you can allow to flow through you. You can allow it to BE you. That’s all you have to be – is to be kind, and compassionate. Because that energy is coming from the Light within. And when you touch people – or even just be near them – they can feel this energy of love – the Universal Love that we talk about that comes from the Creative Source of All. I will leave now, my children, and I hope that you think about this – and work on yourselves. Just ask God to release you from all the negative emotions that you hold within so that the shadow is released and your light will shine. And people will notice this see it. But that is not the only thing, they will feel the Love that comes from the Source of All Creation.